Some of the most common questions I receive are about photography. I have already spoken in some detail about the choice of cameras and lenses, but I have not yet spoken about how to choose a computer to be used for the purposes of photography. In fact, in this age of digital photography, the computer has become an indispensable extension of the photographic process. First of all for storing your photos as well as for displaying them, but especially for developing them. I have already said on numerous occasions that: the post-processing of images is a natural extension of the photo taking process. It is indispensable for finalizing your photos. I will not expand any further on the reasons why I say this, suffice it to say that there are some important things that just CANNOT be done while shooting and which must be managed during post-processing, namely contrast and color levels as well as the intensity of bright zones and shadows, etc. Long story short, to heighten the quality of your photos, you will need to go through post-processing, which raises the question of choosing a computer that will allow you to do so comfortably. Since computer technology evolves at an exponential rate, I did not want to make a guide that would propose specific models for you to choose from: that would be pointless since it would make this guide useless after only a few months. I wanted instead to explain the principles that you should follow when making your selection of a computer for photography – which will be valid for years to come. So, if you are reading this article 2 years after I wrote it: keep reading, everything I said is still applicable! Please note that everything that I say in the following paragraphs is only valid for photo editing (mainly when using Lightroom or some other equivalent software), and that I am not taking into consideration all of the other things that you may want to do with your computer. If you are interested in editing videos, you will need a more powerful configuration, if you intend to game with your computer, you will need to pay close attention to the video card that you choose, etc. However, if all you want to be able to do with your computer is some office work and surfing the internet, a PC oriented towards photo editing will be able to handle these kinds of activities without any difficulty. At the same level of performance, a desktop computer will always be cheaper than a laptop model. Corollary: for the same price, a desktop model will be significantly more powerful. Basically, for the same price you will have a more comfortable computer to work on. It is more upgradable, in the sense that, in general, you will be able to easily upgrade its components in the future without having to buy a whole new computer. If you are telling yourself“I don’t know anything about computers, so none of this concern me”, you are wrong: it would be easy for you to find someone who knows enough about computers to change a few parts on your PC, and who will do so for a small fee – which will cost you much less than buying a whole new computer. 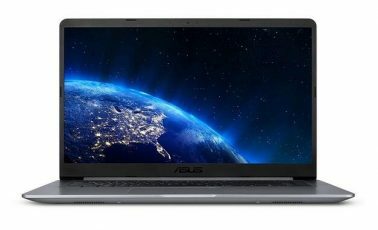 The main advantage of a laptop is, obviously, that it is portable, but it will cost you more for the same level of performance than a desktop model would, and it will be impossible for you to upgrade its parts to make it more powerful in the future. Moreover, laptops have one major disadvantage: the integrated display only usually provides average performance as far as photo editing is concerned. This is mainly due to the fact that in the vast majority of cases – except in the case of the most high-end models (and not always) – the luminosity and contrast of the display changes in function of its orientation, making it hard to achieve faithful color rendition under all circumstances. Therefore, if you are thinking about choosing a laptop, you should ideally have an external monitor to connect it to. It really depends a lot on your personal preferences. If you only need a laptop for basic internet activities, think about getting a tablet. There are many tablets available for very reasonable prices and they are more than powerful enough for sending emails and checking your Facebook page. 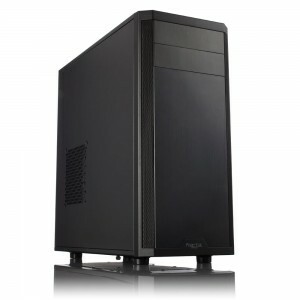 In this way you will be able to invest in a more powerful desktop computer than if you had bought a laptop as well. Whenever this question is raised, generally a war of words will ensue between supporters of both systems (I expect that there will be many comments made about this article). That is why I will clearly state: one system is not better than the other as far as photo editing is concerned. Personally, I have recently switched to using both a Macbook and desktop computer, after having used a PC (Linux and Windows) for years, but I did so for reasons that have nothing to do with photo editing. So, what are the pros and cons of both? Let’s be frank, Macs are not geared towards people on a tight budget, and the price is generally higher – for the same level of performance – than a PC. 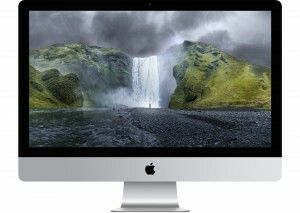 Contrary to what you may have heard, no, Macs are not “better for photography”. I mean to say that there is no intrinsic reason why a Mac would absolutely be better. The software which is indispensable for photo editing works just as well on a PC as it does on a Mac, and the display on a Mac computer is not necessarily better than a PC’s display (or worse for that matter). A word of caution: Macs, by default, all come with a glossy display panel, which is honestly not great for photo editing. That having been said, anti-reflection products are starting to become seriously effective, and as someone who hates glossy displays, I can tell you that I am no longer bothered after applying this kind of fix. Don’t forget that no matter what computer you use, you can always connect it to an external display, so the display that comes with the computer should not necessarily be a factor in preventing you from buying a Mac. As for what model to choose, all Macs that are being sold at the moment would be able to properly run photo editing software. Obviously, the closer it is to being an entry-level model, the slower it will work, but none of the currently available models would be dramatically slow. Besides all of these considerations, I would say that Macs are slightly more advantageous for those users who are not very computer savvy since they are a little bit more intuitive for “non-geeks”. All other aspects concerning ergonomics, system stability and design are more subjective and do not have a direct impact on photo editing: it is up to you to decide whether these aspects are important to you or not, and if they are worth any extra expense. PC have the advantage (or disadvantage depending on who you ask) of being more configurable, which gives users more hardware options to choose from and makes them easily upgradable (don’t expect to be able to take an iMac apart in order to change its hardware, it is already a great thing to be able to change the RAM). It is also possible to find very good mid-level PCs that will last you for many years and which sell for a very reasonable price (approximately between 700 and 1100$). If you don’t feel like doing much research in order to choose a computer for your photographic needs, you should know that any computer with a “Gaming Plus” configuration or higher will be more than sufficient. As a matter of fact, I myself chose a computer with a “Gaming Plus” configuration in October 2012, and 2 years later, it still has no problems running Lightroom, Photoshop, etc. Of course, you can order a computer that has already been assembled and is ready to go (this is actually what I recommend that you do), which means that you won’t have any problems getting started even if you are not very comfortable with computer technology. And Linux, where does it fit in? I know that if I don’t speak for a moment about Linux, I will receive complaints from my readers (who may also want to stone me to death for high treason). As a gross oversimplification, Linux is an operating system (like MacOS or Windows), but one that is open source and free. You can download it legally, for free and install it on your computer. There are many Linux “distributions” (different branches if you prefer), some of which are, frankly, as easy to use as a Windows computer or a Mac. · If you already know about Linux and are interested in using it, you probably don’t need my help at all in order to choose a computer. · The simplest and most powerful programs (yes they are paid and proprietary), which I recommend for photo editing – mainly Lightroom – are not available for Linux. This is not to say that it is not possible to do photo editing using this operating system (there are other free and open source alternatives which are not half bad), but I won’t discuss these programs in great detail. What are the technical characteristics to take into account? If you don’t feel like giving much thought to the computer that you choose, you can pretty much stop at what I said before, and choose a tomshardware configuration, or a Mac that suits your needs (while keeping in mind that you need to set aside a budget for the monitor, I’ll come back to that later). If you do want to make a more informed decision, please read the following section: I will be listing the various computer components and their respective importance for photography. If you don’t understand everything that I say, don’t worry: you can always choose one of the configurations that I spoke about earlier, just ask a sales person for a model that complies with the specifications. The processor: is your computer’s brain, it is what is going to do all of the calculations required by your photo editing software. It will have an influence on how fast the operations are performed (which is important for your comfort as a user). It will also have an impact of the time that it will take to export your photos (it is always nice that this process be fast, but it is not a completely necessary requirement – you could always be doing something else while Lightroom is exporting your photos, like having a cup of coffee, doing some macramé or cuddling up to a kitten). It is therefore important to choose a model that is not too “entry-level”. 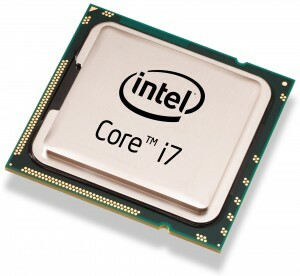 In 2017, an Intel i5 is the minimum, but buy an i7 instead if you can afford it. While it is almost always the case anyway, make sure that you get a 64 bit system since 32 bit is rapidly becoming obsolete (this is pretty much the case already) and it would seriously limit your abilities in the years to come. Random Access Memory (RAM): it is less important than the processor, however 4 GB is really the minimum these days, and you should consider getting at least 8 GB especially since RAM is not that expensive. You should know that RAM is the component that would be the easiest for you to upgrade in the future (it takes 15 minutes maximum to add more). The graphics card: the importance of this component is negligible as far as photo editing is concerned, just make sure that it has the necessary connections for hooking it up to a high resolution display (which you will probably have one day), meaning a DVI Dual-Link or a DisplayPort connection. The hard drive: this is the component that stores your photos. Its capacity is measured in TB (terabytes) and will determine the number of files that you will be able to store. 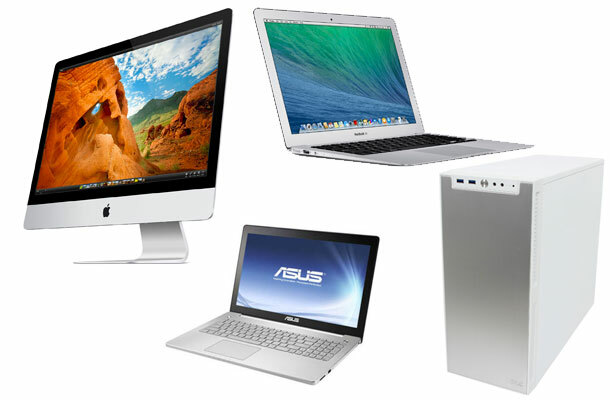 Their price has dropped significantly as of late, so choose a model with at least 2 TB of storage capacity. Its speed – in revolutions/minute – will determine how fast you will be able to access it. Make sure that you chose a drive that spins at 7200 RPM; most mid-level computers exceed this specification these days. SSD: an SSD allows you to store files in the same way that a conventional hard drive does, but it uses flash memory to do so (just like the one used in USB keys). Advantage: it is much faster at reading and writing data, which will speed up your software when you search for photos in your catalog. However, the gain in speed for photo editing itself will be negligible. Disadvantage: this extra performance has an added cost – SSDs are generally much more expensive. 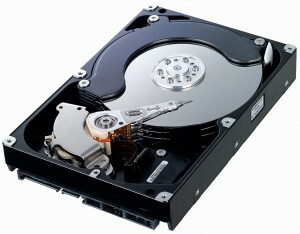 Some computer make use of both systems: a small SSD for installing the operating system and the software, and a large conventional hard drive for storing files – this solution takes advantage of the best features of both systems. 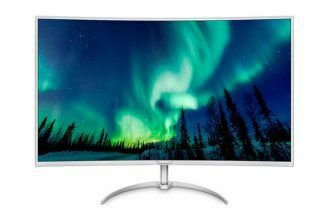 The Monitor is really THE most important consideration when choosing your computer equipment, much more important than the computer itself. As far as the computer is concerned, you only have to know that the one you have chosen will work more or less well. However, photographers should really know more than this about their display – the subject deserves its own full-length article. In the following paragraphs, I will give you some criteria to look for when buying a monitor for photo editing. Before continuing, I would just like to say that if you have chosen to buy a laptop, I highly recommend that you invest in an external monitor: it will be useful for many years to come (it becomes “outdated” much more slowly than a computer does), and it will turn photo editing into a much more enjoyable experience. What should you look for in a display? · An IPS, matte, display panel. TN display panels (which are used by the majority of displays) have a luminosity and contrast which changes in function of the viewing angle. How can you expect to tell what your photo really looks like if it changes every time that you look at it from a different angle? The answer is that you can’t. That is why the choice of display panel is such and important consideration. Glossy display panels should be avoided due to the bothersome reflections that they are subject to. · Good color rendition, which is determined by what is called the “delta E”. This complicated name simply refers to the difference between the color which should be displayed, and the color that is actually displayed. The smaller this difference (delta E) is, the better the display’s color rendition will be – it’s only logical. This does not mean that you will not have to calibrate your display in order to guarantee perfect color rendition. 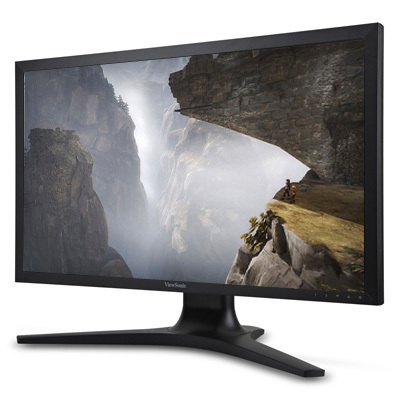 · If possible, a good sized monitor. A 27 inch monitor is very comfortable for photo editing. Do not choose a monitor any smaller than 21 inches if you are buying a new monitor(but don’t get rid of your old 19 inch model either after having read this article ). · If possible, a display with a fairly large color space – one which includes almost the entire AdobeRGB color space. Was that last statement gibberish to you? Let me explain. 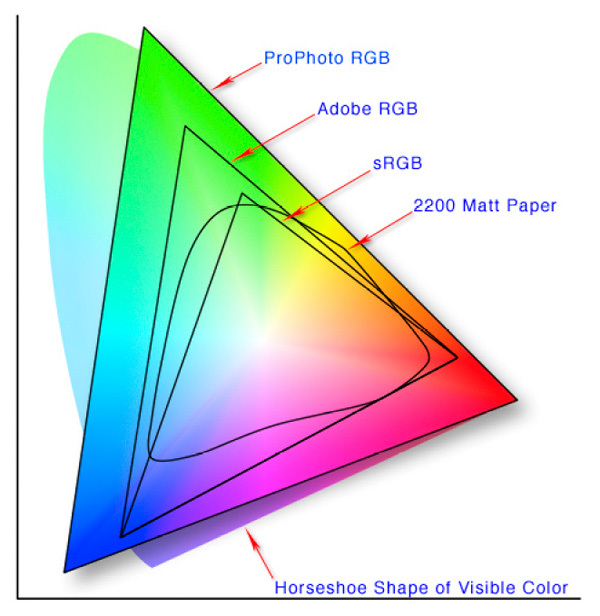 The color space is the totality of the colors that a display is able to show. It will always contain fewer colors than humans are able to see with the naked eye (nature is still much better than our technology for the time being). There are several standard color spaces: sRGB – which is widely used and already shows a wide range of colors; it is the color space most often used in displays. AdobeRGB, which displays many more green shades of color (which makes the color space larger). 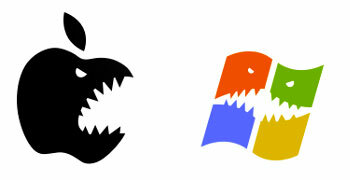 There are a few other color spaces available, but they are much less common. · A Monitor capable of showing more colors will allow you to see more nuances in the green shades of color. Keep in mind that it is an additional degree of comfort which may sometimes be useful, but if you don’t take many portraits, you will hardly ever notice the difference. So don’t get too hung up on AdobeRGB – especially if you can’t afford it. How to make your final choice? If you are thinking about buying a desktop PC, your best bet is to choose one of the configurations available from Tomshardware. They offer systems with the best quality to price ratio around, so simply choose a system that is in line with your budget (but keep in mind that you will also need to purchase a display). Laptops are constantly changing, so I recommend that you use the comparison feature on Amazon. Look for a model that has a 5 star rating for both the laptop and the display – which will give you a much smaller selection to choose from (again, consider buying an additional external monitor or only buy a laptop than has an IPS display). That’s it for now, I hope that his guide will assist you in making your selection, especially if you were planning on getting a new computer sometime soon, but didn’t know how to navigate through the confusing world of available products! If you have any questions, don’t hesitate to ask!